Summary: Seven animals are profiled—the land snail, hummingbird, garden spider, honeybee, potter wasp, beaver, and stickleback. The emphasis is on what each animal builds to help it stay alive. A web, a nest, a honeycomb; each example of animal architecture is marvelously illustrated with intricate pop-ups that show the animal with its creation. 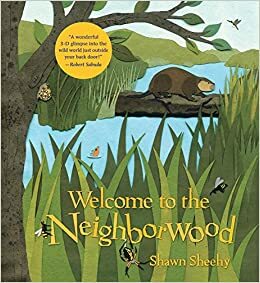 The final page, “Neighbors” has one magnificent pop-up that includes all of the animals, and explains how humans and all these creatures are interdependent inhabitants of the “neighborwood”. 16 pages; all ages. Pros: The text is interesting and educational, but the incredible pop-ups are the real stars here. 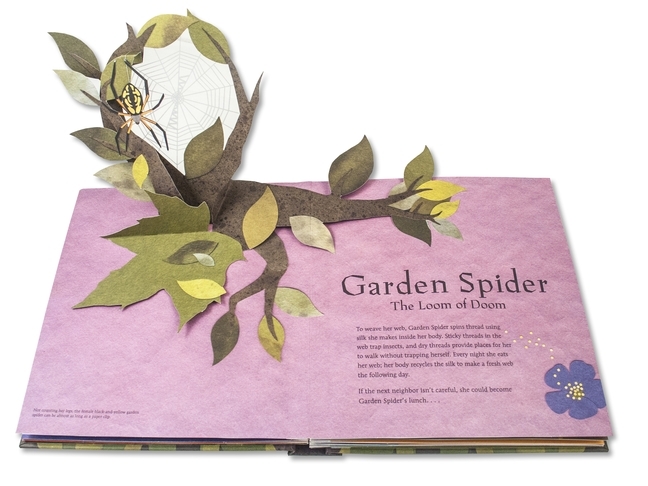 Readers will gasp with delight as each page is turned to reveal an amazing animal habitat. Cons: Due to the price and the fragile nature of pop-ups, this may more suitable as a gift for a special child in your life than a purchase for the library shelves.